Gods create things. Universes, in fact. It may sound complicated, but, as they say, ‘Magic, once explained, is merely science.’ The gods do it with three skills. They use willpower, visualization, and concentration. When we explain it, you’ll see creating things isn’t as complicated as it might sound. First, consider willpower. Gods have a lot of it. You might not think Bernie received his fair share, but on the scale of gods vs. men, you will find every god has a ton of it. They need willpower to conceptualize the vastness of what they’re trying to do. If they didn’t have enormous willpower, as soon as they had the idea of creating anything as big as a universe, they would be so overwhelmed, they would just give up. Willpower is essential. The second thing gods need is the ability to visualize. They must carefully picture in their minds exactly what they’re trying to create. It has to be fully three-dimensional. One reason Wanda was good at her creations was her excellent visualization skill, which came from her detailed planning. Bernie, on the other hand, was weak in this area because he often tried creating things before he’d thought everything out. The third thing a god needs is enormous concentration. Think about what’s going on here. With the willpower it takes to create on a cosmic scale, they then have to visualize exactly what they want to create. Every detail of the creation has to be understood and pictured perfectly in their mind. Then they unleash their power of concentration. It is the concentration that makes the visualization real and gives it substance. Then the god moves on to the next thing he wants to create, carefully repeating the process over and over until his universe is complete. Now one thing about the nature of universe creation might surprise you. When a god first creates something, it’s quite fragile. During the visualization phase, almost anything can destroy the creation. It’s like a sculptor creating a statue with soft clay. During the visualization phase the artist shapes his sculpture and makes it look exactly the way he wants. The concentration phase is like baking the clay to make it hard and strong. The gods do the same thing. Until this concentration process is complete, their creations are very delicate. That’s why gods have to be careful with their creations until they have a chance to set properly. Many things contribute to a godly creation being more complicated than any sculpture, but nothing more so than the creation of living things. The gods must imbue their creations with the spark of life. They may even want to define the purpose of that life. Although the spark is instant, it can take a while for the creation itself to absorb the spark and fully understand what their creator wants. If the god doesn’t concentrate long enough, you end up with a creation that’s alive but has no idea why. How is Universe Putty used? 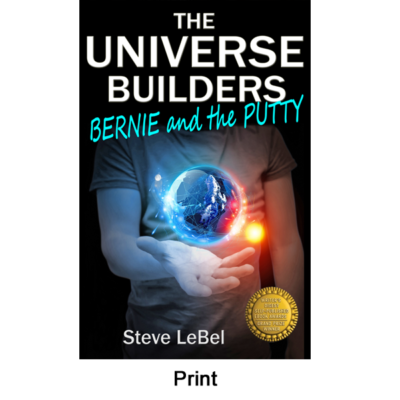 Well, during the creation process, the gods use the putty in both the visualization and the concentration phases of creation. During the visualization process, it is helpful to slap a little putty on your visualization to keep it in place while you are working on other details. For example, as you visualize one side of the object you want to create, you can add some putty to it. This freezes your visualization. Then you can pick it up, turn it over, and work on the other side; you don’t have to keep thinking about the first side anymore. You’re free to give your full attention to the back side. As you can see, putty is very handy stuff. The putty is also useful during the concentration phase. After you complete your visualization, you have to make it real by concentrating on it. If you add a dab of putty, you don’t have to concentrate for as long. This frees you to go on to the next part of your plan without having to wait until the last thing you created is completely dry. As we said before, not all gods are created equal. Some gods have better visualization skills. Others are better at concentration. Because of this, some gods don’t use as much putty as others, but everyone uses at least some. In school, students are taught good workmanship, so they learn to go back periodically and remove any excess putty. First of all, it’s expensive. Second, leaving it all over your creation is a sign of slovenly workmanship. But more importantly, too much putty can cause unexpected consequences, so you have to be careful. It is, after all, pure creative power. And the only really safe place for it is packed away in the jar it came in. This entry was posted in News, Writing Inspirations. Bookmark the permalink.